Niki Lauda once again took advantage of the opportunity to display his judgment and guile when he beat his faster and younger team-mate, Alain Prost, to take the title. This was to be the first of many great years for McLaren. Alain Prost stunned the Formula One world when he upped and joined McLaren, after falling out with Renault's management. With the TAG/Porsche engine up to speed, McLaren looked to be the best bet.There was a clean sweep at Renault, with Tambay and Warwick joining as Cheever found a new home at Alfa, where he was joined by Patrese. Ligier had sourced Renault and attracted de Cesaris from Alfa. He joined French newcomer François Hesnault. Arrows had a BMW deal, and two good drivers in Boutsen and Surer, although they would start the year with DFVs. Tyrrell produced a nimble car and was blessed with two great rookies, Stefan Bellof and Martin Brundle. Gone fom the frame for 1984 was Theodore, with owner Teddy Yip opting instead to run a car in the Indycar championship. One ruling was to give the teams a headache. This was the reduction of the fuel allowed for a car in a race, from 250 litres to 220, with refuelling pit stops banned. Teams took to cooling their fuel pre-race so that it reduced in volume and thus more could be squeezed into the tank. New Ferrari signing Michele Alboreto led in Brazil, but spun out, letting Lauda and Warwick take turns in front, but the English driver's suspension broke, Prost came through to win, while Rosberg showed the Honda's potential with second. McLaren was dominant in South Africa. Piquet led until encountering turbo problems, and Lauda sailed to an easy win. Prost had to start in the spare, and stormed through from the back to take second. Toleman's Ayrton Senna scored his first point. The European season kicked off in Belgium and a return to the unloved Zolder. Alboreto led all the way from pole for his first win in a Ferrari. Warwick was second for Renault. 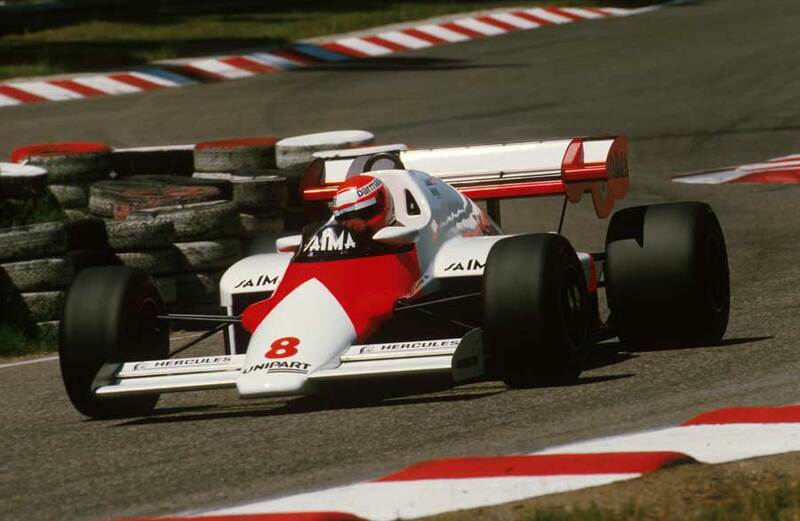 McLaren was on form at Imola, as Prost led all the way, despite a spin. Lauda retired with engine failure and Piquet held second until a turbo failed, so Arnoux inherited the place. Renault desperately wanted to win in France, and Tambay led most of the race, but had brake and clutch problems, letting Lauda by to win. Monaco was wet, and Renault's Tambay and Warwick crashed at the first corner, while poleman Prost led Mansell. Mansell took the lead and pulled away, only to crash. Prost regained the lead and was still in front when the race was red-flagged, and half points were awarded. At Montreal Piquet was back on form. The Brabham had a new oil cooler in the front, intended to help with weight distribution, but the side effect was that Piquet burned his feet while leading from start to finish! Detroit started with a shunt between Piquet, Prost and Mansell, for which Nigel got the blame. All three were back for the restart, and Piquet led all the way. Star of the race was Brundle, who climbed to second. Next was Dallas for yet another race on a temporary track. It was ragingly hot, the track broke up, many crashed and the circus never went back. Rosberg was the hero, winning in style. Mansell led, but his gearbox broke and he collapsed while pushing the car to the line. Sanity returned when the circus returned to Europe for Brands Hatch, although the race was stopped after Jonathan Palmer crashed his RAM. Prost led until his gearbox failed, leaving Lauda to win from Warwick and the improving Senna. De Angelis and Piquet retired while leading at Hockenheim, leaving Prost to win from Lauda. In Austria Prost spun off when second, and a gearbox-troubled Lauda won from Piquet and Alboreto. Piquet led early on in Holland, until he suffered an oil leak, so Prost and Lauda completed another demo run. By now the McLaren stars had a lock on the title: Lauda 54, Prost 52.5. Prost's engine blew in Monza, and once Piquet did his usual trick of retiring while leading, Lauda cantered to victory ahead of Alboreto. By now Tyrrell had been banned for irregularities found in Detroit, losing their points. Many saw sinister undertones in the way the sole "atmo" runner was thrown out. For the first time Formula One went to the new Nurburgring for the European Grand Prix. Prost led all the way, while Alboreto and Piquet - both out of fuel - were second and third. Lauda finished fourth after a spin, making it Lauda 66, Prost 62.5. The finale was at Estoril, and Prost won, while Lauda did all he needed to do and came second to secure the title by the closest-ever margin.